This full day course will teach you various methods of making jewellery incorporating prints, images, writing and ashes to create some lovely memory jewellery. Please note that to complete this course you will need to have some skill with computers, mainly image manipulating software. Here we will look at taking a print using inkless wipes and paper. We will then look at scanning the image into the computer and I will show you how to manipulate the images to make them ready for turning into photopolymer plates. To do this I will use the free software Gimp, although you should be able to use similar steps n whatever software you use at home. I will show you the templates I have set up for printing the images onto the transfer paper, and what the best settings are to use on the printer to get the best image. We will then turn an image into a stamp using the photopolymer plates and discuss timings and exposure. I will show you how to use the imagepak gel sachets to make the stamps, and we will discuss the other varieties available. You will turn an image into a stamp to take away with you. We will then make a couple of pieces (I will provide 10g of clay for this). 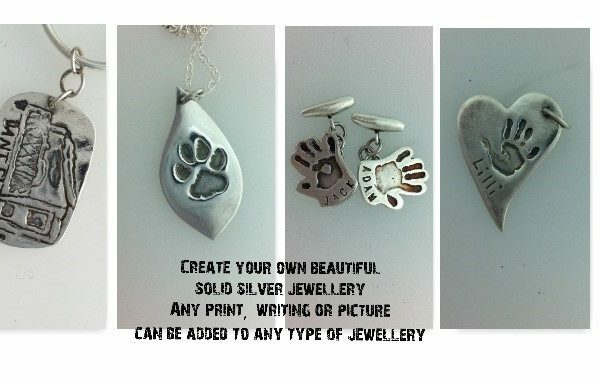 As this course is mainly about the prints, I will not spend too much time talking about using the clay, so a basic knowledge of making silver clay jewellery would be an advantage. We will use the fingerprint mould and the stamp you have made, and we will make a small container to add some resin after firing. While the pieces are firing, we will discuss Hallmarking your pieces, the law around selling jewellery and I will talk about my experiences of setting up a business and going full time into it. We will cover pricing your work, costing, and keeping records, and touch briefly on marketing. I will talk a little on business planning too. Once your pieces are fired I’ll show you various methods to finish them and get a good shine. I will then show you how to add patina, and finally how to add some UV resin including mixing colour. You can then add some UV resin to your container piece. All materials required to make one fingerprint mould and a photoploymer stamp, an inkless wipe and some paper. I will also send across the templates used for printing the transfer for the plates after the course. Please note there is no course handout so bring something to take notes on. You will need to bring a laptop so you can manipulate your image. If you can download a copy of Gimp before you come on the course that will help (this is free software). The templates I use are on Powerpoint so a copy of this or equivalent office software is required too.